Overnight, Paris has turned into a winter wonderland (although, sadly, without snow). In the past week, holiday lights have appeared, merchants’ windows are filled with holiday cheer, and florists are selling Christmas trees and wreaths. Restaurants and street venders are selling vin chaud (hot wine), caramel apples, roasted chestnuts, and of course, hot chocolate. As my friend and I made our way to the Petit Palais, a museum near the Champs-Elysees, we stumbled upon one of Paris’s traditional Christmas Markets. Small white sheds lined the street from Place de la Concorde to the Champs-Elysees roundabout, each one belonging to a different vendor selling their holiday wears. You can get practically anything at this market – from cards, clocks, and hats to windup toys, metal sculptures, and music boxes. It is really a one-stop shop for gift shopping — and make sure you come hungry. Vendors sell saucissons sec, too many cheeses to count, wine and cider, doughnuts, crepes, waffles, fries – the list just goes on! After returning from our museum and market visit, I was really in the mood for holiday cheer, and could only think of one thing: BAKING. More like “procrastabaking”, as we took a break from homework and decided to make cookies. 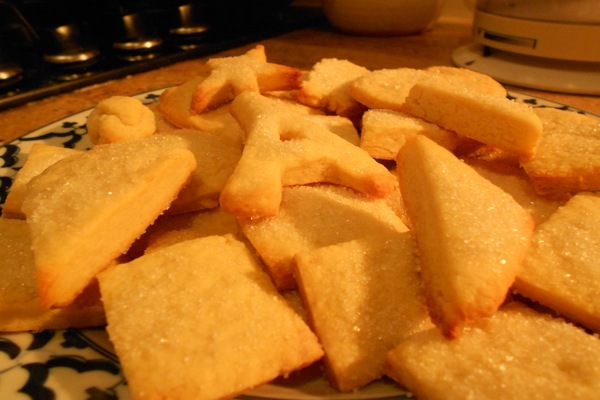 Pretty soon, we had these traditional French butter cookies, or petits beurres, in the oven. These cookies are soft when warm, but get crumbly when cool – perfect for dipping in coffee or hot coco. The dough comes together very quickly, and these cookies can be made with minimal effort. Place flour and diced butter in a medium bowl. With a fork, pastry blender, or your fingers (my favorite), work butter and flour together, breaking the butter apart into small crumbs, until it resembles cornmeal. Make a small well in the center, pushing flour and butter mixture to the sides of the bowl. In the well, add the sugar, salt, and two tablespoons of cream. Stir with a fork until the dough comes together. Then, knead with your hands until dough is smooth. If the dough is too dry (not sticking together), add more cream one teaspoon at a time. Divide the dough in two small balls and wrap in plastic. Place in fridge for one hour to chill. After one hour, preheat oven to 350°F. Grease a baking sheet (or two) with butter. Lightly flour a flat counter surface, and unwrap one of the dough balls. Roll out the dough gently until it is about 1/4 inch thick (if you don’t have a rolling pin, a smooth bottle will do just as well! Make sure it is closed tightly before starting.) 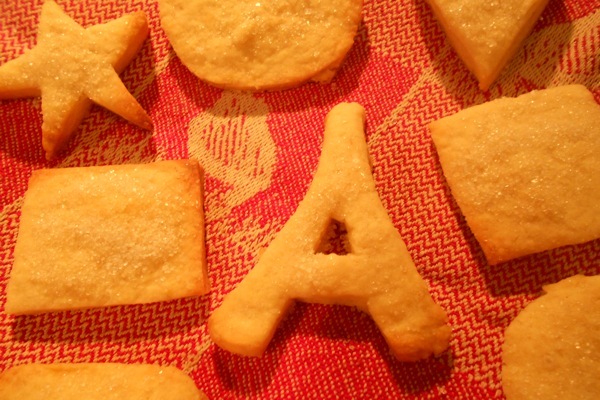 Then, using a cookie cutter, drinking glass rim, or a paring knife, cut the dough into cookies. Place the cookies on baking sheets and sprinkle the tops with sugar, pressing it down lightly into the dough. Bake for 12-15 minutes, watching closely for the edges to brown. The cookies are done when edges are brown and the middle is just slightly soft. Let cool slightly on baking tray (2-3 minutes) and then move to paper towels to dry completely. Store in a cool, airtight container (if you have any left to store…).